As I reported a short while back, I'm sure we lost Cory, our "wild" roadrunner of over four years. Our last visit was early January. But Gerry, her mate and who has been visiting for his third winter is still around--and with his own new mate. 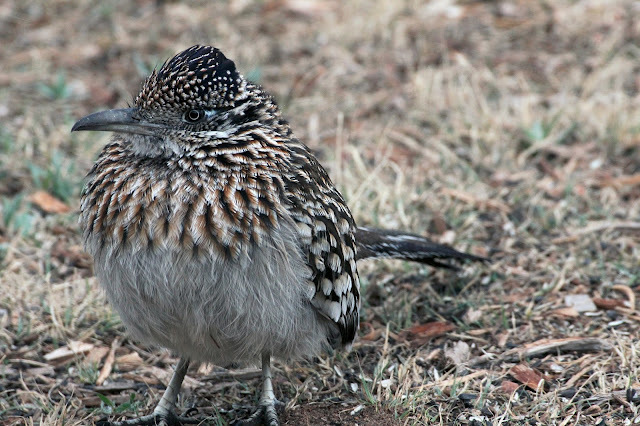 There's not a lot of discernible differences between sexes in Greater Roadrunners. But, the males are slightly larger in size and with some other very minor outward characteristics. However, their behavior is definitely different. Gerry demonstrated this recently while coming up to my lap to get a portion of deer burger, ground venison trimmings from last season's hunting success. I captured a new behavior I had not yet witnessed. Cory, the female, of course did not do courtship display. But Gerry would hold and bring food to her. However, this was the first time I had noticed "tail wagging." Gerry took a relatively healthy portion of deer burger and hopped off my deck into the front yard and started wagging his very showy tail. (Well if ya got it ya flaunt it I guess.) I retrieved my camera and happened to be able to capture some of the behavior before he disappeared into the lilacs where I suspected his new mate stayed hidden. She's still very shy and has yet to learn the value of free handouts. But she will given time and next winter's hunger pangs. Gerry, captured on my new 100-400 Canon zoom.